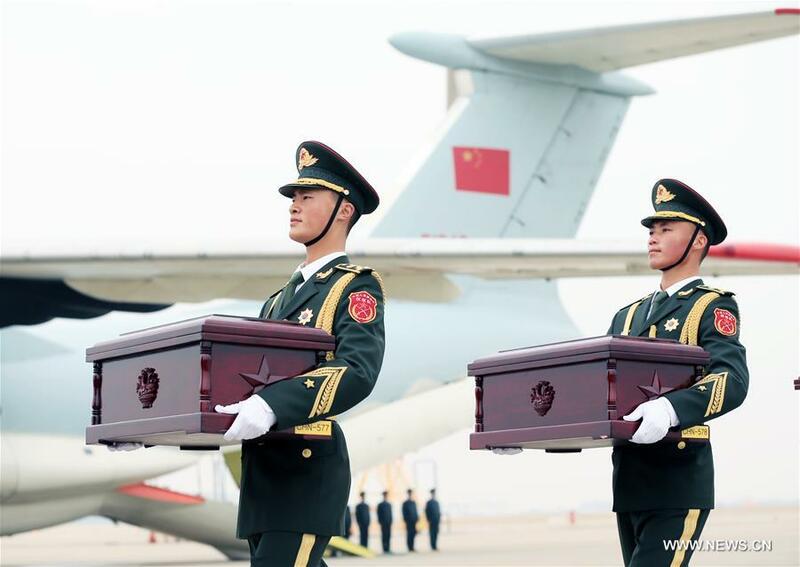 Remains of 10 Chinese soldiers who died in the Korean War (1950-53) arrived in Shenyang on Wednesday. South Korea held a transfer ceremony at the Incheon International Airport in Incheon, west of the capital Seoul, to hand over the remains of 10 Chinese volunteer soldiers killed in the war. During the ceremony, South Korean troops handed over the coffins to Chinese soldiers, which carried them, covered by China's national flag, into an airplane. It marked the sixth transfer ceremony. Since 2014, South Korea has transferred the remains of 599 Chinese volunteer soldiers killed in the Korean War, including 10 more this year. Every year, China and South Korea have consulted on the handover of the Chinese soldiers' remains found in South Korea. The transfer has been usually made days before Tomb-sweeping Day, the Chinese holiday for commemorating the dead, in early April.